mmm very nice colors, I think that’s the most difficult part of having a successful project; getting the colors right! Great colors! Are they Vanna White? 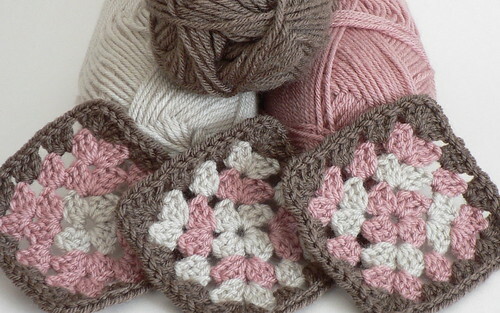 I bought the same colors to make a scarf, but your squares look so nice I might have to use them for grannies instead. My mum and I was stunned and impress with your works .My mother made many crochets (throws,shawls,doillies)using Japanese pattern books with plans , and she is not really familiar with the western guides, By the way i saw the mosaic at your flickr and we both are literally in happy tears looking at those gorgeous work of yours! bravo! I love love love the colors you’re using for this! Your colors, and squares, are gorgeous!! Thanks for sharing!! Very pretty, looks like Neopolitan ice cream!